Map It! 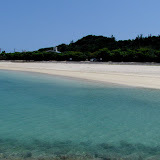 Okinawa: "Hamahiga Beach"
On the quiet little island of Hamahiga you will find a nice sandy beach that faces the Katsuren Peninsula. Its white sand and clear blue water gives it a great touch for summer time fun as well as a nice place to unwind with the family throughout the year. Because of its remote location you will likely find it less populated than some of the beaches that are near the more densely populated towns in Okinawa. 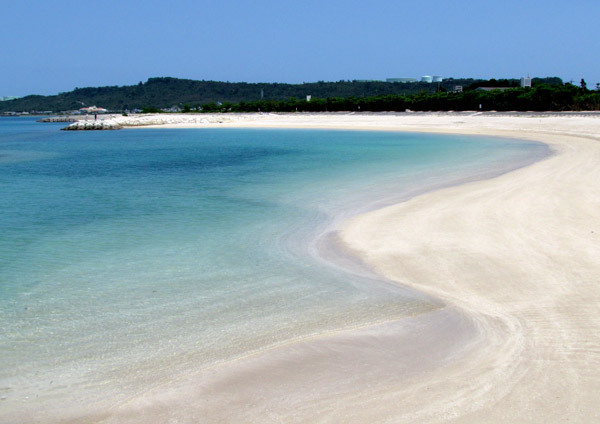 Grab a towel, cause this is one of the nicest beaches to visit during your stay here on Okinawa. Below are guidelines posted on site (translated in English). 1. Lifeguards are not present. Use caution and proper supervision of your children. 2. No diving off the rock jetties. 3. Please clean up after yourself. 4. No fireworks, camp fires, charcoal grills etc. 6. Pets must be on a leash. Please pick up any droppings left by your pets. 7. Because the beach is near a neighborhood, please maintain reasonable noise discipline in the area. Recommendations. There are very few shaded areas on site. Highly recommend bringing your own equipment for shading. Directions. Take Highway 10 east (Kaichu-douru Bridge) from the Katsuren Pennisula. You will see visible signs directing you to Hamahiga Island. The route to the beach is straightforward once you arrive on Hamahiga Island. Please see map above. Other places of interest nearby. Starting point – Off The Beaten Path, Hamahiga, Agari no Utaki, Amamichu's Grave, Shirumichu, The Gateway. They got a beer garden there, too. I think !